Theremin World - Topic: Let's Design and Build a (simple) Analog Theremin! You can use LTSpice to create wav files. Search help for .wave. Here are a few lines from the help file. LTspice can write audio files. These files can then be listened to or be used as the input of another simulation. I've used this many times with reasonable results. Over on the "basic experiments" thread [LINK] Dominique mentioned the Franklin oscillator, which was news to me so I thought I'd investigate it a bit over here so as not to disturb that thread. It's just a non-inverting amplifier with very small drive and sense capacitors going to the LC tank. It just barely oscillates in simulation so I presume it's worse in real life, and so I'm disinclined to take this investigation beyond the sim phase. 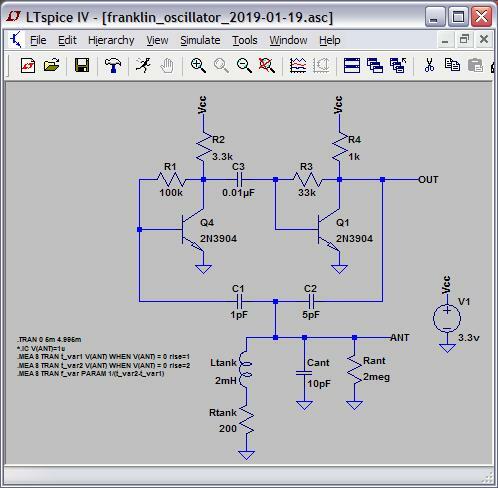 If you run the sim you'll see rather significant phase shift from the input to the output of the amplifier, which is a tank voltage swing killer, particularly with high Q tanks. Amplifier input and output are connected together, which rarely works well. And the larger the tank L the more trouble it has oscillating. And literally all of the components have to be tweaked in order to get it to do anything at all. I could be missing something, but I would avoid this circuit if I were me. There doesn't seem to be any magic analog oscillator topology out there that works optimally with untapped inductors. By "optimally" I mean that generates the full tank voltage swing that a high Q inductor is capable of. A 3.3V supply is capable of +/-1.65V at the drive side, which can ideally produce +/-165V with a Q=100 coil. Single transistor types rely on phase error to function, and two transistor types have inherently high transport delay, which usually introduces more phase error than single transistor types. My digital quadrature LC DPLL topology is the only thing I've encountered that approaches full theoretical tank swing. The EW with low impedance LC driving a high impedance EQ coil is close, but it is non-linear - worse, it has two resonances that you have to worry about, one of which is environmentally-based. Thank you, dewster, for estimation this oscillator type. The hint from Mark for making sound outputs in LTspice is super!